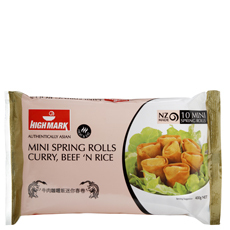 High Mark 10x40g pack Heat & Eat Mini Spring Rolls. Made in NZ with 100% NZ Beef. Ideal for entrees and snacks. Just heat in the oven.